Microsoft has revealed that it has sold two million of the music players since their launch in November 2006, revealing relatively flat growth for the device lineup. The results leave Microsoft with just a fraction of Apple’s US share and with comparatively slow development. The company has primarily affected marketshare of Creative, who has dropped from four to two percent marketshare year-over-year, but has been unable to dislodge second-place SanDisk (at 11 percent) or the top-selling iPod. Apple, in its latest quarter, sold 10.6 million iPods, or more than five times Microsoft’s cumulative sales to date. At this point, Apple’s more likely to cannibalize it’s own iPod sales with more advanced devices, like the iPhone, than Microsoft is doing with the Zune. Microsoft’s recent Zune update moves the platform forward, but not as quickly as Apple is doing with the iPod/iPhone. It is worth noting that the results (2 million units sold) are boosted by heavy discounting. While Apple is known for never discounting current products (and they enforce this among their retail partners as well), Microsoft has been “generous” with discount promotions, coupons, giveaways and other methods in order to “sell” the 2 million units. 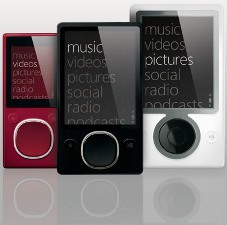 You can find numerous reports online for coupons and sales of new Zune players for close to 50% off the retail price. If the Zune line continues, then it will only be because Microsoft doesn’t want to concede defeat, not because there is any business case for continuing.